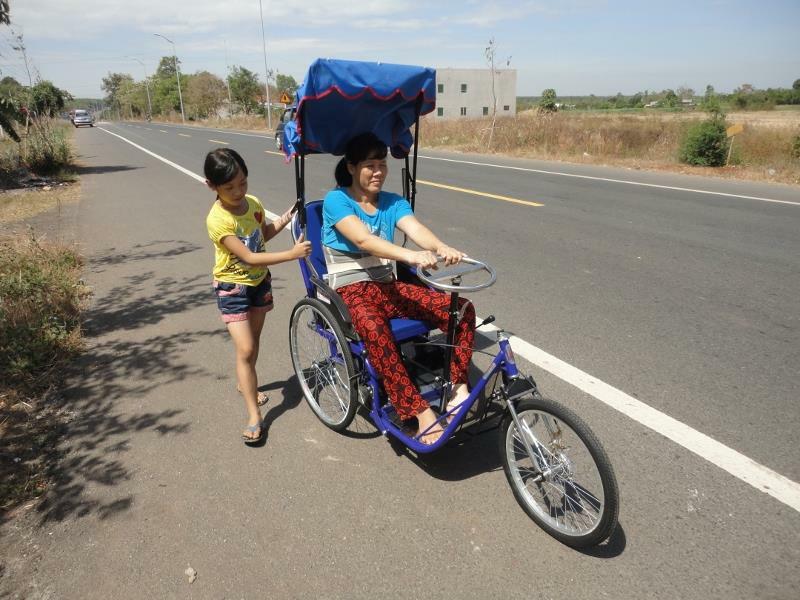 In 2015, one of the club's newest members, Michael Redding, presented a donation from the Rotary Club of Werribee of a Kien Tuong tricycle wheelchair to Ba (Nguyen Thi Ba), a 39 year old disabled mum living in Phuoc An village in Vietnam. Three years ago, Ba fell four metres from a bamboo ladder when harvesting black pepper, severely damaging her spinal cord and losing the use of her legs. Subsequently, her husband deserted her, leaving her with two children to raise. Ba was extremely delighted for the gift and very grateful to the Rotary Club of Werribee. She now has mobility and the opportunity to travel by herself to the market and to visit friends. Her life can now expand in new directions that were never possible in recent years. In 2017, a further donation was made for the supply of another wheelchair to Mai Thi Huong who was born in 1974 with a severe deformity in her left leg. Over time, her leg muscles have atrophied. Walking has become increasingly difficult. She relies on crutches to move about and travel outside. She has been unable to receive corrective surgery and rehabilitation. Click here to read more about Huong's story and her renewed sense of hope since receiving her wheelchair. Rotarian Michael has a passionate interest in helping people in Vietnam who have similar problems to Ba. With the help of the club, he plans to continue his mission of goodwill.